The importance of well-prepared bacon transcends the material world. 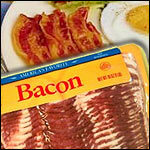 Dream interpretation books the world over list bacon as symbolizing continued prosperity. Cooking bacon in your dreams means you will receive a gift or surprise. On the flip-side, a vision of rancid bacon suggests forbidden situations and the need for you to see a doctor. Safety first: Shield yourself from spattering fat. When the sound of sizzle hit the ears, the dish-washing gloves hit the hands. Prepare a plate for the finished bacon ahead of time. Layer two paper towels on a plate and have another paper towel at the ready. If frying in a pan, choose a pan large enough to accommodate the full length of the bacon strips. The more room you have to work with, the better your chance of success. Lay the bacon in the pan or on the skillet BEFORE turning on the heat. Do not let slices overlap - not even a little. Cook on a setting slightly above medium. Too much heat means the bacon will cook too quickly. A cooking time that exceeds five minutes is not only fine, it is preferred. As the bacon begins to shrink, flip each slice separately with a fork - make sure the slices remain as flat as possible after flipping. At this point, flip each slice at least once every 45 seconds. Drain off excess fat midway though cooking time -- about 2 minutes after the bacon begins to sizzle. Carefully remove pan from heat, hold the bacon down with a wide spatula and tilt pan to drain fat into a container. There's no need to get rid of all the liquid - just enough so the slices don't have to swim and fry at the same time. Well-made griddles allow the fat to drain though the nature of their construction. Forget this step if using one. Finished bacon will be brown and firm, not necessarily crispy in the pan. With a fork, transfer each finished slice to the plate lined with paper towels. When all the pieces are there, dab the top-side of all slices with the other paper towel. Turn off the heat. Remove the gloves. Pat yourself on the back. Your crispy bacon is now ready to serve and enjoy. There are a number of devices, including the Presto 05100 Powercrisp, you can use to help make crispy bacon in the microwave. The magic of their design is that the bacon is held above a receptacle which allows excess fat to drain. These devices are effective, but there is another device that works nearly as well and is much cheaper. It is called a paper towel. Place a paper towel on a paper or microwave-safe plate. Lay slices of bacon on the plate, not allowing the strips to overlap - not even a little. Cover the bacon with an additional paper towel. This not only helps remove excess fat, but prevents splattering in the oven. Set the microwave to high (100%). Cooking times are: 1:40 for two slices; 2:30 for 3 slices; and 3:15 for 4 slices. Remove the bacon from microwave. Pat the slices with dry portions of the paper towels to remove even more excess grease. Serve and enjoy. Then go to the store and buy a large skillet. Bacon from the microwave doesn't taste or smell as good as the same meat prepared in a frying pan. Thanks for the question Greg. I hope your days of the limp and lifeless are over and your future breakfasts sizzle. May you dream of well-prepared bacon and reap the rewards it symbolizes. A great breakfast lover named Bill wrote in regarding this article with one more way to make crispy bacon. "My wife, Nina, has a suggestion to add to your interesting article on crispy bacon. She makes "perfect" bacon using the conventional oven in our range. Heat the oven to 400. Place desired amount of bacon on broiler pan, not overlapping. You're baking, not broiling. No need to turn the bacon. Takes about 15 minutes, but keep it under surveillance." Thanks for the advice Bill and Nina! How do I make oatmeal in the microwave? Why do we drink orange juice at breakfast? How do you boil an egg? What is English Breakfast Tea? What does it have to do with breakfast? Is it possible to roast an egg? What makes beef become corned beef? Can I use a crockpot to keep scrambled eggs warm before serving? My 10-year-old son will not eat breakfast. What should I do? 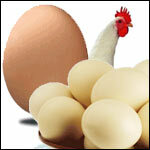 Why are eggs associated with breakfast in so many countries? Where does the word breakfast come from? What is gruel and did orphans really eat it? 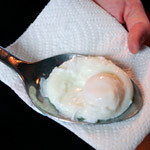 How do I poach an egg? Why are some eggs white and others brown? 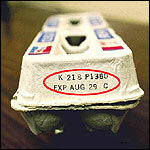 When do eggs go bad?